Larry Semon’s The Wizard of Oz achieves by association what other films achieve by quality. It’s been restored, re-scored and redistributed ahead of better films with less notoriety. It’s a wreck, but the car’s very famous, if you know what I mean. I wish I could ask Semon, a slapstick comedian, former vaudevillian, magician and cartoonist, what merit he saw in his script. It scrapes and claws the bottom of the gag barrel, turning what could’ve been a run-of-the-mill bad film into something offensively awful. Contemporary audiences didn’t much like The Wizard of Oz, but the film is downright appalling to modern viewers, who can compare it to their gold-standard: the 1939 Judy Garland classic. Readers of Silent Volume can also compare it, negatively, to its 1910 predecessor, The Wonderful Wizard of Oz. 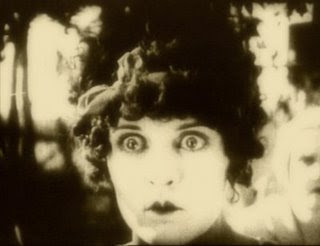 The 1910 short departed radically from its source material, but we can forgive that, partly because it was a short, and partly because it, like the 1939 film, is well made. Furthermore, the 1910 Wizard’s core themes of fun, fear and fantasy remain sympathetic to L. Frank Baum’s book. Semon, however, degrades the Oz story to an astonishing degree, and because it’s this story, something we all shared as children, his film seems profane. Briefly, then, to the story. Prime Minister Kruel (Josef Swickard) maintains a tenuous grip on power in the Land of Oz, thanks in part to his advisors, the Wizard (Charles Murray) and Ambassador Wikked (Otto Lederer). Opposing him is the populist Prince Kynd (Bryant Washburn). Where, asks Kynd, is Dorothea, Princess of Oz? She’s been lost since infancy—eighteen years ago now—and it’s time the Prime Minister produced her. Sound familiar? No? Already we’ve seen Oz reduced to a banana republic ruled by achingly bad comedians. But that’s OK, because we now leave this mess of camera-muggers for the Kansan farm. But wait… eighteen years... Dorothy’s eighteen? This girl looks even older than that. The actress is Dorothy Dwan (and Semon’s wife; insert joke). Unless Kansas is a vacation destination for Vegas showgirls, she just doesn’t belong. Yeah, she’s secretly the Princess of Oz, but that don’t explain the rouge. Dorothy’s such a hottie, you can’t blame the two farmhands for trying their luck. Semon plays the nicer of the two; he’s scripted to be lovable, though he isn’t. His opposition is a larger, less klutzy, less lovable man played by Oliver Hardy. 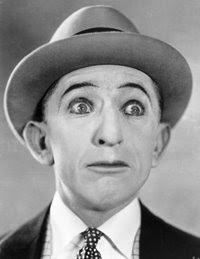 Hardy, of course, would later pair with Stan Laurel to form a legendary comedic team. I doubt this film would have topped his resumé, even in 1925. The scene in Kansas leave you begging for a cyclone—or a hurricane or an earthquake—anything to bring it to an end. Try to avoid your watch as Semon delivers some of the most cliché’d (and plot-deadening) slapstick comedy you’ve ever seen. Bee stings? Eggs in the pants-pocket? Mud puddles? Where’s my cream pie, Larry? Ugh. Even Hardy can’t save this crap. But a shout-out must go to Semon’s Uncle Henry, played by the incredibly fat actor, Frank Alexander. He’s as round as the ‘O’ in Oz, and he’s the only one who made me laugh every time he tried. He even sits on a cactus! A cactus in Kansas! 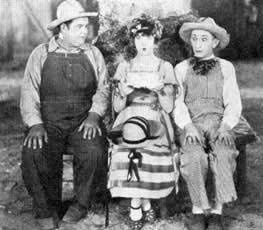 That Larry Semon: nothing gets in the way of his gags, that’s for sure. Which brings me to ‘Snowball,’ the third farmhand. He’s played by Spencer Bell, a black actor who also went by ‘G. Howe Black,’ probably in films even worse than this one. Snowball likes to take his breaks in the watermelon patch, and why not? Watermelons are even harder to grow in Kansas than cacti. Just don’t sneak up on him, ’cause he scares easily. Kruel’s agents (OZ KGB?) mercifully kill the farm scene with their arrival, via biplane. After threatening the Gales at gunpoint (yes, you can pack heat in Oz), the entire crew is taken to the Emerald City, where further hilarity ensues. 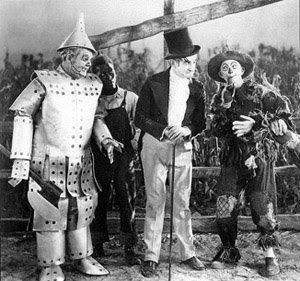 Why yes, we are delivered the Scarecrow, Tin Woodsman and Cowardly Lion, though only briefly. Semon’s straw-man costume is a trick, making it appear as though the Wizard can cast spells on inanimate objects. Hardy prat-falls into a pile of scrap metal and emerges in accidental get-up. Snowball stops quaking his knees long enough to disguise himself as a lion, though that backfires when he meets a real lion. And away we go. You wonder how so much money could be spent so poorly. The Wizard of Oz actually looks great. It’s cleanly shot, with an abundance of costumes and elaborate sets. Semon’s cast is strong, particularly Hardy and Alexander. But his gags destroy the narrative flow, and by abandoning all but the basest elements of Baum’s book, he denies himself a good story to fall back upon. Nor does The Wizard of Oz go far enough the other way. A dishy, adult Dorothy could have been Step One toward a funny, adult-oriented variation, but Semon’s humour is too juvenile to execute it. The movie even fails as basic slapstick. The gags are old and telegraphed; the characters are witless. The big stunts (such as Hardy and Semon falling from a grain elevator) don’t work either, because Semon’s trick camerawork has them hit the ground like rubber balls. One should think twice about abusing the laws of physics, especially in a fantasy film. If these two can’t be killed by a fifty-foot drop, what else can make us fear for them? The Wizard of Oz is the worst film I’ve ever profiled on this site, and will likely remain so. I can recommend it only as a curiosity, but really, isn’t that what it’s always been? And isn’t that why I watched it, even though I knew its reputation well? If nothing else, it reminds us what good years 1910 and 1939 were for the Oz story. But do those movies really need Larry Semon’s help? They've already got the brains, the heart, and the nerve. Hey, I'm new to blogger you can find me at http://www.dorothycostume.us, and your site is very related to mine; I'd thought it would be beneficial for both of us to do a blogroll link exchange. Please let me know if you're interested. Hi Kenneth--sorry for the delayed response. My blog roll's only for movie sites, but I wish you luck with your business. If you want to post a note to this movie review (along the other Oz-themed film I've written about thus far), I'll put it up, and delete this one. Sorry to communicate this way--I couldn't find an email address on your blog.